Moreover being a rainy season everybody crave for some hot snack at tea time. So I decided to prepare some hot vadai for snack. Thavala vadai is Prepared from a fusion of many lentils – bengal gram, green gram and toor dal,urdhal and rice which makes the recipe more interesting. . This protein rich nutritious snack is a unique kind of vadai in Tamilnadu.it’s raining here ,all i want is cup of tea with these delicious vadas .. they looks sooo tempting . 1. Soak toor dhal, channa dhal and rice together in water for two hours. Soak Moong dhal and urad dhal separately in water for the same two hours. Wash all the pulses in water. 2. Grind toor dhal, channa dhal and rice along with red chilles hing and salt coarsely together in a mixer. 3. 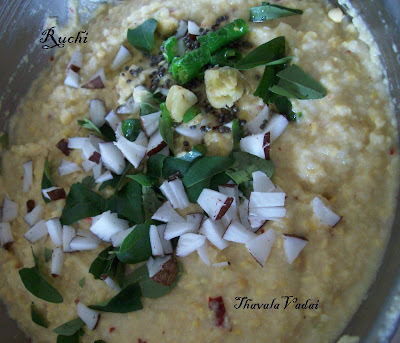 Grind urad dhal in mixer finally add Moong dhal to the batter and grind for one sec. 4. The dough should not be soft. Finely chop the ginger and green chillies. 5. In the pan, pour the oil and add the mustard seeds. When the mustard seeds begin to sputter and add the chopped ginger and green chillies and curry leaves and fry for a while and add these to the dough along with coconut piece. 6. Heat the oil in the pan and test the oil by adding a pinch of dough and when the dough rises up immediately then the oil is ready. 7. Make small patties of the dough and drop it into the oil and fry Turn it till it becomes golden brown and become crisp..
8. 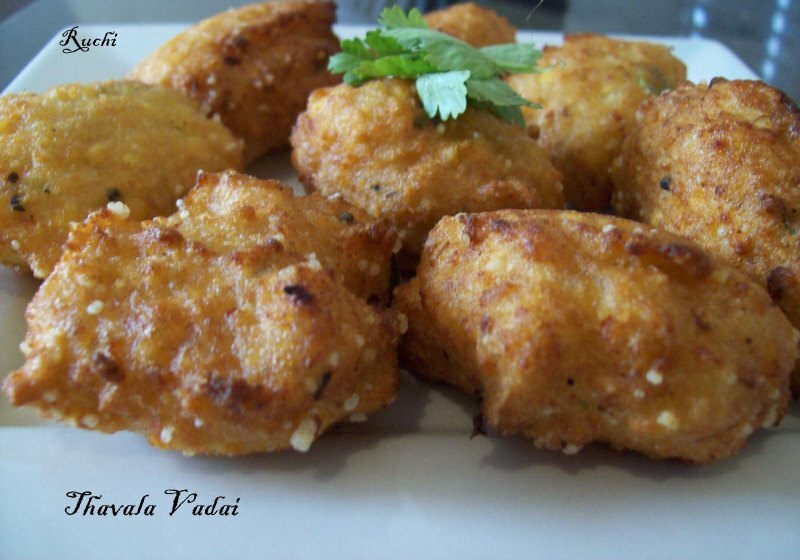 This delicacy is famous vada is crispy and tasty and packed with proteins. Serve it hot with chutney. Having hot vadai/wada with hot tea or cofee in rain is great fun! Enjoy!! YESS!! Its the season for pakoras, vadas, fritters or anything spicy & crispy!! 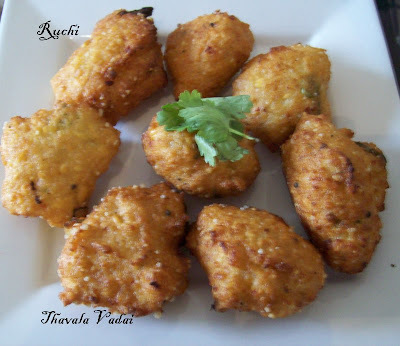 This thavala vada too makes a perfect treat for a rainy day!! perfect for the monsoons with a cutting chai !